Unfortunately, my real life is going to be very busy next week. That means, I won't be able to hand out PoG prizes before the start of the next month. I'm very sorry for the inconvenience this may cause! I had hoped I would have time, but alas. That said, you can take your choice card from the red task immediately after drawing your image! I have faith in you doing the most beautiful job, so have that as an apology for delayed prizes! This week's theme is Animation studios. Now that we are the rulers of the Three Kingdom's it's time to visit the school of gods and help them learn about humans. You have until November 1st at 12:01PM CET to complete these tasks. Good luck! Since I failed to post last week, all prizes this week are doubled! Last time, Niou wass Hotarumaru from Touken Ranbu & Yagyuu was Shikamaru Nara from Naruto! This round will end on Wednesday, October 7th! Welcome back to Crosswords! Afer some absence, the game continues biweekly on Sundays with a new host. 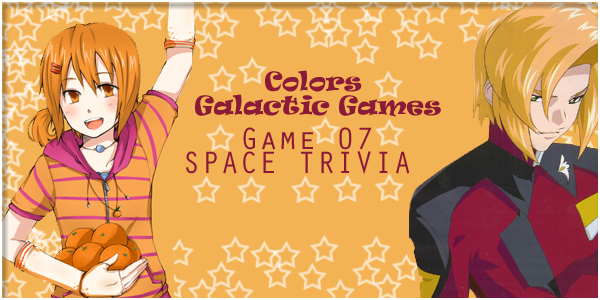 This week's theme is Colors Game Hosts, to celebrate our change of host! Last time Niou was Hamuzo from Idolmaster, Yagyuu was Hamtaro from Hamtaro, Miria was Cham-P from Super Dangan Ronpa 2 and Isaac was Carrot from The Wonderful Adventures of Nils! This round will end on Wednesday, September 16th! Last time Niou was Sagara Sousuke from Full Metal Panic! and Yagyuu was Leona Heidern from King of Fighters series! What's this? Miria and Isaac make their first guest appearance! They heard what kind of a theme Niou and Yagyuu were planning this time around and wanted to join them. So this week we have four characters to identify! Give me the names of the characters Niou and Yagyuu + Miria and Isaac are cosplaying as and series these characters come from to win eight random cards. This round will end on Wednesday, September 9th! There will be an extra week of Kamila, because I was a derp and forgot to mention in on the post. Just click the banner! Last time Niou was Ryou Machiko from Koufuku Graffiti and Yagyuu was Souma Yukihira from Shokugeki no Souma! This round will end on Wednesday, September 2nd! Help Miss Kamila - 81 | Bonus round! I was told to give you a hint... apparently all the banners are related to each other by their "voice". I wonder what that means?? The banner had the wrong badge on the upper right corner, but it has now been corrected. You might not have seen the original, but if you're confused it might need refreshing before appearing. The colors, however, in both decks are the same. Can you tell me the colors of these cards and banners, so I can help Miss Kamila? I will sniff twelve cards out for you and bring them back! Remember, I don't need the names - I'm a Pomeranian, after all: I can't read! Closed. The answers where blue, blue, yellow, gray, red, green. This round will end on Wednesday, August 26th! Last time Niou Levy McGarden from Fairy Tail was and Yagyuu was Levi from Shingeki Kyojin! This round will end on Wednesday, August 19th! Well, that was too fast for me! I decided to look for something easier to catch... but it's not always that easy! Even this guy seemed to be talking by himself... and for some reason his hair switched places a few times!! Why did he need the feel to do that? I don't understand. Should I try it too? Mikan is still ecstatic over being able to host this years league! Because of this she's welcome a visitor from ZAFT to help her with her game! Heine Westenfluss has helped her come up with some quite tricky questions. Are you ready to show them your knowledge on space series? <b>Your name:</b> <b>Your team:</b> <b>Your Answers:</b> 1. 2. 3. 4. 5. 6. 7. 8. 9. 10. BONUS.